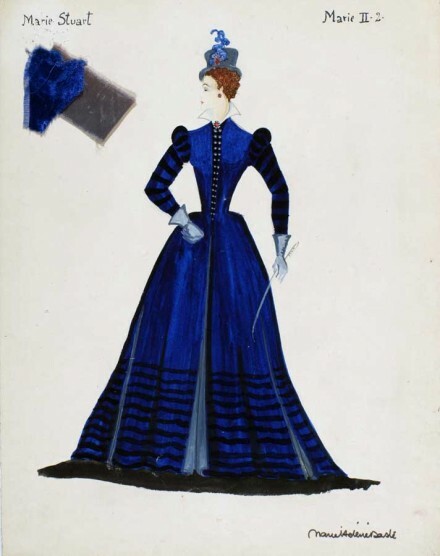 Marie-Hélène Daste (1902 - 1994), technique mixte, Costume pour "Mary Stuart" de Marcelle Maurette. This show groups about 500 theater costumes models together, dating from the beginning of the 20th century. A whole collection built by Jacques Crépineau, an enthousiast specialist and Théâtre de la Michodière director. The costume model was a working element among many others, it is the first glimpse of what the actor will represent and radiate on stage. The model makers work closely with the director, the production designer ; everything needs to converge on the same idea, color, movement… Today, it is an unprecedent chance to be able to see these costume models which gave Folies Bergère or Théâtre de l’Athénée shows their reputations in the early 20th century… To be able to appreciate a great collector’s collection is also an incredible chance.